Dr Jules Mantler wanted to become a Veterinarian from an early age. In 2001, she was lucky enough to combine two of her passions, travel and veterinary medicine, when she was accepted to Murdoch University College of Veterinary Medicine in Perth, Western Australia. She graduated in 2005, and after staying in Australia for nearly 6 years, she made the decision to come back home to Vancouver. She has practiced at many clinics around the lower mainland, and even owned her own clinic, but in early 2017 she happily settled in with the team at Burnaby Veterinary Hospital. 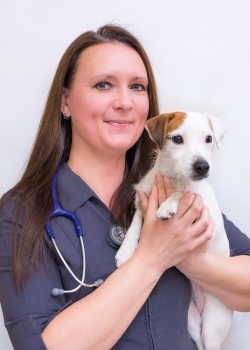 Dr Mantler has always been interested in applying a more natural approach to veterinary health care, while keeping up to date with the most current conventional methods in order to provide you with the best possible options for your pet. In 2015 Dr Mantler continued with her education in animal health and wellness and received her International Veterinary Chiropractic Association certification from Options for Animals College of Animal Chiropractic in Wellsville, Kansas, USA. From her further education and years of experience she is committed to taking a whole-body approach and believes in integrating good nutrition, physical and mental (behaviour) wellness, as appropriate medical care into her wellness plans for your pet. Dr Mantler has 3 jumping Jack Russell Terriers, Smash, Hazzard and Kaos, who keep her very busy outside of the hospital. She actively competes with them in Agility, Lure Coursing, Barn Hunt, Dock Diving, Rally-O, and Nose Work, as well as endlessly walking and hiking with them in an attempt to tire them out. She enjoys long road trips to all parts of the USA to compete in Jack Russell Terrier Trials with the Jack Russell Terrier Club of America.